In our metros, there is no dearth of young professionals who wish to contribute to the society, but stop short of doing so, only due to lack of suitable opportunities. Pankhudi Foundation, with its volunteer-based model, offers such volunteering opportunities to hundreds of such individuals. This article looks at the nuances of running an NGO such as Pankhudi � given its rapid growth in the last 5 years � and intends to explore further in terms of sustainability of the organization and threats that it faced. Using information collected by means of extensive primary research, the NGO has been analysed based on different parameters like Sustainability, Life cycle and Stakeholder analysis. An IIT alumnus Mr. Shahzad Vakeel started Pankhudi Foundation in April 2005 as an Orkut community for people with day-jobs interested in social work in Mumbai. The foundation began with a goal to uplift the underprivileged children in the society. Today, Pankhudi Foundation is not just confined to the city of Mumbai, but it has opened its Chapters in six other cities, including Allahabad, Chennai, Delhi, Hyderabad, Pune and Bangalore1. All Pankhudi operations are categorized based on two broad lines � projects and campaigns, as listed in Exhibit 1. 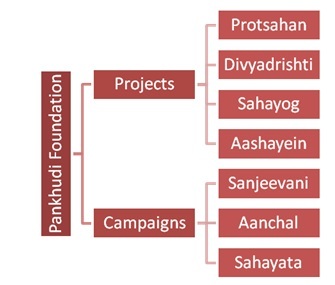 An analysis of the working of Pankhudi Foundation paves way for a detailed understanding of the organization in terms of scalability, the spread of the foundation, as also the possibility of replicating the model. A look at the growth factors needed to establish a sustained model and an examination of the sustainability of the current model of the NGO follows the basic analysis. This first step to analysing the NGO on its scalability and possibility of replication of the model is to understand in detail what the model actually is, i.e. the working of the Pankhudi Foundation, and how it is different from other NGOs. The organization is characterized by a lack of hierarchical structure, wherein reporting relationships � where at all � are very loosely defined. Shahzad Vakeel, the Founder President, is perceived by all members as the head of the foundation2. Each city chapter also has four functional heads, elected/appointed for a period of one year, wherein a person who has once held a position, cannot be reelected to any of the representative positions. This means every volunteer gets to officiate in at least one functional head position during his time at Pankhudi. This helps bring about a sense of ownership towards the organization in each volunteer�s mind. Exhibit 1shows the relatively flat organizational structure that exists within Pankhudi. Chapter Representative: The chapter representative serves as the single point-of-contact of a Pankhudi city chapter for both external organizations like NGOs, banks or the government and with the other city chapters of Pankhudi. They are also instrumental in organizing the All India Meets of Pankhudi. PR/Resource Representative: The PR representative liaises with the media and with the public relations departments of various organizations in and around the city, particularly for awareness regarding the collection drive. Content Representative: The content representative typically defines what is to be taught in the schools that Pankhudi operates in, and also ensures proper knowledge management of all resources collected till date. Finance Representative: Apart from serving as the caretaker of all funds at the city chapter, the finance representative also ensures that budgeted monetary requirements for at least a year ahead are well in place or can be procured at short notice. For an organization that has been operational for 4 years, the method of procuring funds at Pankhudi still looks ad-hoc, at least on the surface. Pankhudi has thus far taken care of its finances purely based on donations from its volunteers and their personal contacts. In the words of one volunteer, �Pankhudi takes loans from people who don�t expect the money back!� In this respect, Pankhudi closely resembles Vinayak Lohani�s Parivaar in its dependence on individual contributions, although on a much smaller scale. However, the reason behind Pankhudi�s inability to procure funds from corporate sources is more of a legal nature than an experience-based one. In India, for corporate donors to avail of the tax exemption facility over donations made towards social causes, the NGO they make donations to should give them an ATG clearance. Pankhudi did not receive this clearance when it registered as an NGO. If it comes through, it may be expected to help bring in a more sustainable and dependable source of donor funds to the foundation. Pankhudi Foundation is based on a simple model of volunteering that brought together many likeminded people, who wanted to contribute to the society but at the same time were not ready to give up on their professional and personal life. With a surge in the number of volunteers, Pankhudi expanded its operations by taking up additional projects and campaigns such as organizing free health checkup camps in slums and orphanages. Since most of its volunteers are from the IT industry and are professionally educated, they are able to take classes on English and computers. These volunteers also provide technological support to physically challenged children. As Pankhudi turned out to be an attractive opportunity for people with day jobs to contribute to the society, the Orkut community saw a manifold rise in its number of members. Whenever Mr. Shazad came across any individual who is keen to do similar work in a different city he went ahead and opened a new chapter. Since Pankhudi was not bound by any particular operational model, each chapter grew organically by taking up projects specific to the region it operated in. The organization�s design to build leadership through the rotation of roles is another factor driving Pankhudi�s fast growth. This ensures that there is always a capable volunteer available to steer the organization. The fact that Pankhudi has spread to 7 cities in a short span of nearly 5 years clearly illustrates the ease with which this simple model can be replicated. Also, the collaborative nature of its organizational structure makes sure that Pankhudi�s growth is driven by philosophy, and is not hinged on particular individuals. This is an additional success factor, given that most organizations which do not have a second rung of developed leadership. The Pankhudi model can easily be scaled up to cover more cities and help the children who have thus far been denied access to quality education. Currently, the organization aims to �focus�on the prevailing issue of lack of basic education and health of the children who live in slums�. The volunteer model of Pankhudi, though easy to replicate and scale up into newer cities, might be difficult to implement in the villages, since it attracts only professionally qualified part-time volunteers with day jobs. This is a point of contention, given that the poverty levels and access to education in villages are in a far worse state than they are in the cities. The life cycle of an organization comprises of the various stages that it passes through as it progresses further in time, as well as maturity. 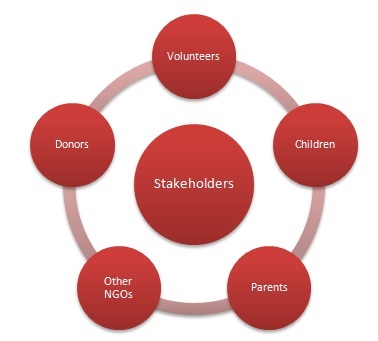 Exhibit 3 below depicts the typical life-cycle of an NGO. Based on the analysis conducted, it can be concluded that Pankhudi is currently in the phase between pre-growth and growth. In order to operate on a larger scale, theory suggests that they should achieve all the major aspects detailed on the right hand side of the figure above. In particular, because of the kind of work the organization is involved in (pure volunteer and mostly time based), there have not been sufficient resources built by Pankhudi nor is there an infrastructure in place. If Pankhudi does indeed intend to scale up, it would be better off with having a well-documented process in place, in addition to creating a comprehensive content module and securing funds for at least one small pucca classroom. A stakeholder is any person, organization or group of people who are affected by the work & existence of the organization, i.e. "have a stake" in it. Exhibit 4 below depicts the various stakeholders of Pankhudi. The stakeholders in this initiative by Pankhudi are the volunteers, the children they are trying to help, the parents of these children, other like-minded NGOs and institutions they are involved with like the Anantha Sisu Sevashrama (A.S.S. ), Nachiket Balgram and S.R.M.A.B. and the donors who are mostly friends or firms that the volunteers work for. Volunteers mainly comprise of youngsters with day jobs who want to contribute to the society, but at the same time, are not ready to give up on their careers for that. The volunteers also play an important role in spreading the word about Pankhudi among their friends, thereby bringing in more volunteers to Pankhudi. There is, however, no accountability on the members apart from peer pressure. The children from slums, orphanages and schools for physically challenged are the beneficiaries of the efforts. Since most of them are from schools with medium of education as the regional language, they are not conversant and at most times are unable to read English. The volunteers of Pankhudi take classes in English as well as Basic Computers for these students. At schools which do not have any computers, the volunteers also raise funds and set up computer labs. The parents of the children from the slums and children from schools for physically challenged are highly appreciative of the efforts of the volunteers of Pankhudi. They say that their children are performing much better after the involvement of Pankhudi. NGOs like A.S.S. and S.R.M.A.B. are all praise for the efforts of Pankhudi. Since the core activity of NGOs such as A.S.S. is to provide better living conditions to orphans, they find it difficult to provide quality education to the children in the ashram. Here the programs by Pankhudi help in improving the education levels of the children. Also small ashrams like A.S.S. find it difficult and infeasible to hire professionals to teach subjects like computers to the children. Pankhudi in addition to taking computer classes also raise funds on their own to set up computer labs in places without computers. The donors primarily include individuals who make donations based on their personal relationships with Pankhudi members. The funds are collected mainly on a word-of-mouth basis. The absence of an ATG clearance for Pankhudi means that donors do not have tax-related incentives either. Until Pankhudi receives is ATG certification, it might find it difficult to raise larger amounts from both individuals and corporate players. However, it is also important to first see if a model like that of Pankhudi actually requires large amounts of funds, given that it does not have any full-time employees or inmates. Overall, Pankhudi�s Bangalore operations do seem sustainable at the current level of activities. The sustainability analysis here focused on availability of resources, impact on those involved and established processes followed. While Pankhudi is doing well on all three fronts, the analysis here has assumed that the current volunteer base remains with Pankhudi in future as well. The kind of people that Pankhudi was able to attract in its initial years has largely driven the success or failure of Pankhudi in other cities where it is operational. The chapter at Chennai is still largely unorganized and non-functional. In Bangalore, Pankhudi flourished in its initial years because of a dedicated volunteer base - this has played no small part in its growth in the city and is expected to carry the momentum forward in the coming years. Trilochan Sastry is the Academic Dean as well as a faculty member at the Quantitative Methods & Information Systems at Indian Institute of Management, Bangalore. He holds a Phd. in Management from the Sloan School, MIT and a Post Graduate Diploma in Management from the Indian Institute of Management, Ahmedabad. He can be reached at trilochans@iimb.ernet.in. Navneet Chahal (PGP 2008-10) holds a B. Tech. in Computer Science & Engineering from Indian Institute of Technology (IIT) Roorke and can be reached at navneet.chahal08@iimb.ernet.in. Rajant Meshram (PGP 2008-10) holds a B. Tech. in Chemical Engineering from NIT Trichy and can be reached at rajant.meshram08@iimb.ernet.in. K Murugesh (PGP 2008-10) holds a B. Arch. from the School of Architecture and Planning, Anna University and can be reached at k.murugesh08@iimb.ernet.in. Sahitha Sagir (PGP 2008-10) holds a B.Tech in Electronics & Communications Engineering from NIT Calicut and can be reached at sahitha.sagir08@iimb.ernet.in.